As a kid growing up in the late 60s/early 70s, they actually used to show movies at 6:00 pm on weeknights on regular network TV (channel 21, 27 and 8 in Harrisburg PA). I know, hard to imagine these days. Some of these were horror flicks that scared the crap out of my sisters and I. The all-time biggie was a TV movie that they showed every October titled “When Michael Calls“, starring Ben Gazzara and Michael Douglas. This was fitting as it took place around Halloween. The plot involved a woman who starts getting phone calls from a nephew that disappeared some 20 odd years ago. The guy would be in his 40s or whatever now, but sounds like he did when he ran away. He has a really creepy kid voice and calls her “Auntie-my-Helen”(?). He asks why she hasn’t come to pick him up at school, says its dark out, and other creepy things, which get progressively more sinister. Then people start turning up dead: An elderly relative dies as a result of a bee attack! The Sheriff is strangled and falls from the rafters of a stage, during the school Halloween carnival–right in the middle of the pumpkin contest no less! All of this was very freaky to little kids such as us, but it was those creepy-voiced phone calls that really got you! This made us afraid to answer the phone for a few weeks after! Sure, the mid 70s was rife with killer bee flicks, i.e. The Swarm, originating from alarmist news stories about killer bees from Africa set to invade the US mere months from now (which they never did, BTW). 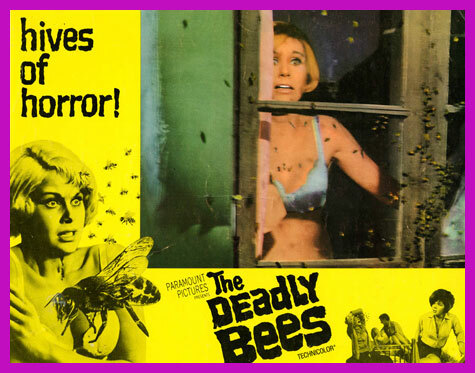 But the original “bee-movie” was the 1967 The Deadly Bees. The plot involves a Brit pop singer trying to get away from it all on a secluded isle, only to face a horde of hostile bees. This was scary enough for us kids–after all you saw bees every day in the summer (at least you used to). BUT, on or around January of 1975, while my parents and I were busy watching the Pittsburgh Steelers in the Super Bowl, my sisters and their friend were down in our basement watching TV, watching this movie specifically. Lo and behold, some real bees who had infiltrated the basement tile ceiling, and must have chewed a hole in one of the panels, dropped down on top of them during the movie! It was like a William Castle movie for real! They freaked out and came running up the steps screaming for their lives! Even though we’d seen this film a few years before on that ubiquitous 6:00 pm movie, this really, really got to them. 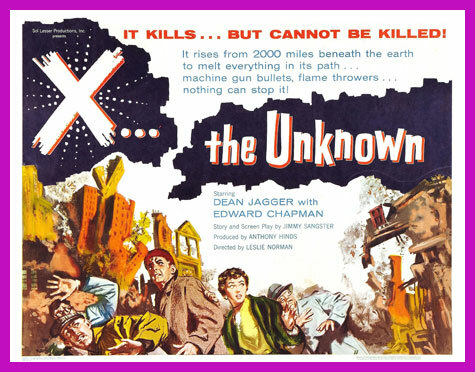 A pretty much forgotten Hammer film from the early 50s (which predated The Blob by several years), this B&W SciFi movie scared the crap out of me when I caught it on that aforementioned 6:00 movie. The story revolves around this living radioactive mud that crawls out of a crack in some swampy stretch of land. It seeks out other radioactive materials and absorbs them, growing larger and larger. It also burns anything in it’s path and makes giger counters go crazy with that ticking static sound they make. It leaves and comes back several times, finally attacking a nuclear power plant. However, by this time authorities can track it since its now so big, and they issue a warning to everyone in its path to get out. The big scene occurs when the killer blob is moving through a small village and a everyone takes refuge in a church. Of course, a little kid somehow gets left outside in the panic. As the deadly goo spills over a stone wall in the church yard, the toddler ambles right up to it, ready to be incinerated in seconds. The priest, realizing what’s occurred, dashes out and saves the youngster in the nick of time. The thing that really got me about this movie was, how do you fight living mud that burns up everything it touches? Its not a vampire that can be staked or a big bug that can be destroyed with the military!